Harry Humphrey Van Gorden, 75, of 315 Hewitt Street, Neillsville, died Sunday morning at Memorial Hospital, where he had been a patient for several weeks. Mr. Van Gorden, son of the late Mr. and Mrs. Schuyler Humphrey Van Gorden, was born February 2, 1881 at Sechlerville, Wis. When he was a small boy, he and his family moved to Jackson County. On February 25, 1902 he was married to Miss Nellie McCullough at Toronto, Canada. Following their marriage they moved to Hixton, where Mr. Van Gorden was in the general merchandising business with his father. They remained there until 1906. Then they moved to Fenwood, where they operated a store. After the burning of their store, they returned to Hixton, and later bought a store in Alma Center. They continued to operate a general store and feed elevator in Alma Center until 1932. That year they purchased a feed elevator in Whitehall, which they operated for seven years. In 1939 they moved to Eau Claire, where Mr. Van Gorden operated the Texaco Oil Company, owned by the family. In 1946 he retired and he and his wife moved to Merrillan. There they resided until 1951 when they moved to Neillsville. Although retired, Mr. Van Gorden still worked at the H.H. Van Gorden & Sons elevator here in Neillsville. He is survived by his wife and three sons -- Archie Van Gorden of Jupiter, Fla., Kenneth Van Gorden of Neillsville, and Bruce Van Gorden, Black River Falls; nine grandchildren and eight great-grandchildren. He is also survived by a brother Clyde Van Gorden of Eau Claire, and a sister, Mrs. Emma Northrup of Hixton. One brother and two sisters preceded him in death. Funeral services for Mr. Van Gorden were conducted Tuesday afternoon at 1 o'clock from the Bergemann Funeral Home, after which the body was taken to the Methodist church in Alma Center for services at 2:30 p.m. The Rev. Wayne Grover, pastor of the Methodist church in Black River Falls, officiated. Interment was made in the Alma Center cemetery. The body reposed at the Bergemann funeral home until time of services. The H.S. Van Gorden & Sons elevator at Neillsville was closed Tuesday afternoon in respect. Pallbearers were all grandsons of the deceased; Heron Van Gorden, Richard Van Gorden, Robert Dierauer, James Doughty, James Selk, and Charles Wasserburger. In charge of flowers were his granddaughters: Mrs. Robert Dierauer, Mrs. Heron Van Gorden, Mrs. Charles Wasserburger, Miss Beth Van Gorden, Miss Mary Ella Van Gorden, and Mrs. James Selk. Out-of-town relatives attending the rites were: Mr. and Mrs. Bruce Van Gorden of Black River Falls; Mr. and Mrs. Archie Van Gorden, Jupiter, Fla.; Mr. and Mrs. Robert Dierauer, Minneapolis; Mr. and Mrs. James Selk, Madison; Mr. and Mrs. James Doughty, Black River Falls; Miss Beth Van Gorden, Watertown; Miss Mary Ella Van Gorden, Duluth, Minn.; Mr. And Mrs. Clyde Van Gorden, Eau Claire; Mrs. Emma Northrup, Hixton; C.O. Pratt, Hixton; Eldon B. Pratt, Spring Green, Wis.; Mr. and Mrs. S.H. Van Gorden, Eau Claire; Mrs. R.W. Tormouske, Eau Claire; Mrs. Rod VanEvery, Milwaukee; Mr. and Mrs. Donald Van Gorden, Siren; Mr. and Mrs. Ray Northrup, Sparta; Mr. and Mrs. Wayne Northrup, LaCrosse, and Mrs. Bela Van Gorden, Racine. *I'm guessing the 'H.' in Harry H. Van Gorden's name is for Heron, as that name appears as the name of Harry's descendants. However, it is a guess, nothing more. Another oddity is that nowhere in this obit. is his granddaughter Nellie L. Van Gorden mentioned, and that is really odd as she was (to near certainty) named after her paternal grandmother, Nellie McCullough. ----Sources: Wisconsin State Records, Census Reports, Daily Telegram; Wednesday, March 2, 1904, Eau Claire, Wisconsin; History of Trempealeau County, Wisconsin, pg. 565 - 566, Madison Capital Times June 13, 1972, By RICHARD P. JONES, Scmid-Stanley Family Album contributed by Robert Treuting. Schuyler Humphrey Van Gorden, senior member and founder of the firm of S. H. Van Gorden & Sons, founder of a chain of stores in western Wisconsin, was born in Horseheads, N. Y., Jan. 22, 1852, descended from a long line of New York ancestry. He came West in 1866, and spent some seven years working on farms near Fredericksburg, Iowa. In 1873 he drove to Jackson County, this State, where he engaged in farming. Later he became traveling salesman for the Davis, Rankin Company, manufacturers of creamery supplies. In the employ of this company he erected creameries at Whitehall, Strum and other places in this region. In 1888 he opened a general store at Hixton. This venture was successful, and he decided to enlarge the scope of his activities. He bought a store at Taylor in 1893, at Alma Center in 1906, and at Osseo in 1911. These four stores were operated under the firm name of S. H. Van Gorden & Sons, S. H. Van Gorden, himself, managing the one at Hixton ; the son, Bert L., the one at Taylor ; the son, Harry H., the one at Alma Center, and Clyde S., the one at Osseo. S. H. Van Gorden is a prominent man in his community, is a director in the Hixton Bank and the Jackson County Bank at Black River Falls, and is treasurer of the Central Wisconsin Telephone Company. 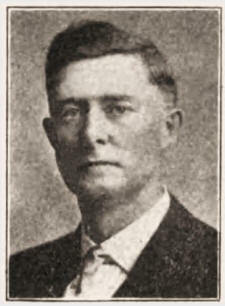 One of the sons, Bert L., is president of the Jackson County Bank at Black River Falls, vice-president of the Trempealeau Valley State Bank at Taylor, and president and general manager of the Central Wisconsin Telephone Company. He is serving in the Wisconsin Legislature as a member from Jackson County. S. H. Van Gorden was married July 4, 1871, at Fredericksburg, Iowa, to Clara Potter, who was born Sept. 20, 1851. ----Sources: Family Records,Wisconsin History Books, Clark Co. Press - Neillsville, Wis.
Bert Lee was born 10 Jan 1873, in Fredericksburg, Chickasaw County, Iowa, the son of Schuyler Humphrey Van Gorden (b: 22 Jan 1852 in Breesport, Chemung County, NY) and Clara Emma Potter (b: 12 OCT 1851 in Freeport, Illinois). Soon after Bert's birth, the family moved to a farm in Jackson County, Wisconsin. Margaret "Maggie" Ann May Van Horn (b: 21 Oct 1872 in Hixton, Jackson County, Wisconsin) became Mrs. B. L. Van Gorden, 24 October 1894 in Hixton, Jackson Co., Wisconsin. 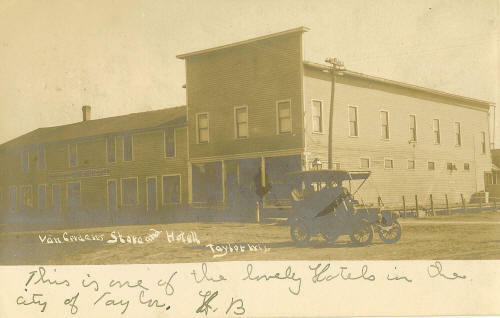 They operated a hotel and Store in Taylor, Jackson Co., Wisconsin which was owned by Bert's father. Two children were born to these proud parents, Bela Bert Van Gorden (b: 20 June 1900 in Taylor, Wisconsin) and Donald Schuyler Van Gorden (b: 03 Jan 1903 in Taylor, Wisconsin). Bert L. Van Gorden passed away 25 June 1941 in Taylor, Wisconsin. Three years later, 17 Sep 1944, Maggie was buried at his side. Bert Lee Van Gorden (Rep.) was born Jan. 10, 1873, in Fredericksburg, Ia., removing with his parents to Jackson county in 1875, where he has since resided. He attended the common schools until the age of sixteen, when with his father he organized the firm of S. H. Van Gorden & Son, who now have general mercantile stores at Taylor, Hixton, Alma Center and Osseo. He is proprietor of the Van Gorden Hotel, and part owner of the taylor Milling Company. He is president and general manager of the Central Wisconsin Telephone Company, president of the Jackson County Bank at Black River Falls, and vice president of the Trempealeau Valley State bank at Taylor. He has served as a member of the county board for fifteen years and two years as its chairman; was school clerk for sixteen years and a member of the board of education of Jackson county. He was elected to the assembly in 1914, receiving 1,142 votes against 786 for David K. Carter (Dem.). Taylor is a village in Jackson County, Wisconsin, United States (not to be confused with Taylor County, Wis.), along the Trempealeau River. The population was 476 at the 2010 census. This digitally enhanced image is protected by copyright laws. The original card was contributed by Robert Treuting. 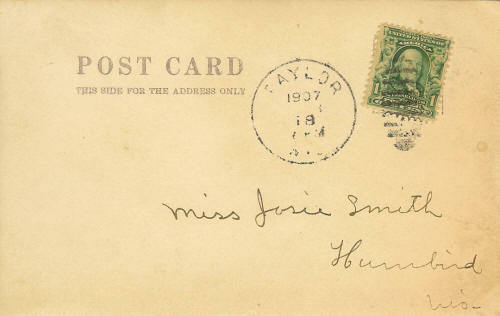 It bears a 1 cent stamp and a 1907 Taylor, Wis. postmark. It can be yours with a $25 or greater donation to this non-profit site. Clyde S. Van Gorden. manager of the Osseo branch of the firm of S. H. Van Gorden & Sons, was born in Hixton, Wis., Aug. 7, 1892, son of Schuyler H. and Clara (Potter) Van Gorden. He passed through the graded schools of Hixton and in 1908 was graduated from the Hixton high school. In 1909 he was graduated from the Winona Business College, and subsequently took a year's course in Letters and Science at the University of Wisconsin. He assumed his present duties June 15, 1911, when the Osseo store was purchased. As manager of this store he has been very successful, and has built up a flourishing trade. He is a director in the Farmers' Exchange Bank of Osseo, and in the Central Wisconsin Telephone Co. For two years he has given good service as a member of the village council. His fraternal affiliations are with the Masons, the Modern Woodmen and the Beavers. In the Masonic order he is a member of the Blue Lodge at Osseo and of the Chapter at Eau Claire. Mr. Van Gorden was married Aug. 27, 1912, to Elsie Caley of Waterford, Wis., the daughter of Henry and Ellen Caley, a graduate of the Whitewater Normal school, and for several years a successful teacher. Mr. and Mrs. Van Gorden have two children : Clara Jeanette, born Sept. 28, 1913, and Ethel Ellen, born Jan. 10, 1915. EAU CLAIRE (UPI) — Clyde S. Van Gorden claims he's no inventor—far from it. Still, now 79 and retired, the Eau Claire man at one time pioneered such things as prefab houses, attic vents, plywood boats, radio equipment, cements, crack proof plaster, gun bluing, and even dust mops. It was just luck, said Van Gorden of his ideas. "They all seemed to hit me at the right time, I guess." he said. A couple came while he was dreaming. Van Gorden, who now lives in Florida during the winter months, said in a recent interview he can't recall ever having one idea that didn't work out. "I managed to make them come through," said Van Gorden, who admitted, however, some cost him restless nights. Back in 1940 that insulation came out," Van Gorden explained. "People explained. "People didn't know how to cope with it. He said moisture would form in the attic. "I dreamed about that all night," said Van Gorden. The next morning he constructed a vent at his factory that would release moisture in sort of a "chimney effect." Another restless night brought gun bluing. Van Gorden said gun manufacturers in 1956 were not satisfied with the one method of giving the guns a rust proof finish. He said they were dipping guns into a hot alkaline solution for considerably less. "You actually got a black finish," said Van Gorden. The "stuff" is now sold in gun shops around the world. His family still owns the company. Van Gorden still holds the patent on the plywood boats he once dreamed about. The plywood boat was much lighter than other boats at the time, and allowed the weekend fisherman to put his boat atop his car to go off to some of the many Wisconsin lakes. The older boats were those with wooden slats. They had to remain in the water all the time to maintain the seal between the slats. Once soaked, they were too heavy to move from lake to lake. There was danger of theft, however, when left at the dock. Van Gordon's family didn't think much of him as a young ham radio operator. Still, he later opened his own radio station before such large Midwest cities as Chicago and Milwaukee had theirs. WTAQ in Osseo went on the air in 1923. He built the station's equipment and operated it until 1937, the year he sold it to a Green Bay company. Van Gorden remembers being a guest when KYW first went on the air in the old Chicago Congress Hotel, and in 1927 when WTMJ first went on the air in Milwaukee. Following the sale of his station, the idea of prefab houses hit Van Gorden. His first house, a single-story, two b e d r o o m home with a basement, went up in 1940. It cost him $2,150. A federal housing inspector, who got wind of Van Gorden's attic vents, came to Eau Claire and discovered the prefab houses. Van Gorden said he was thus the first person to receive federal housing loans to the project. During all this time he was making a little profit on dust mops. The removable-washable kind sold 100,000 when first placed on the market. "I'm just enjoying myself now," said Van Gorden recently. "I read a lot, and I still have my ham radio set." He does a little gardening too. "I've got a tomato plant I've kept growing for 45 years," said Van Gorden. "I've been saving the seeds. It's an acid free tomato. "I don't consider myself an inventor though--far from it." Van Gorden added with a laugh, "Just lucky." home of J. s. Machette.